Bob's Burgers asks, "What if Collateral were about quilts?" 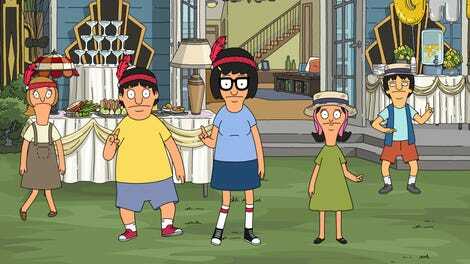 Bob’s Burgers has a hell of a track record with episodes built around birthday parties and Bob driving around. The first season’s “Sheesh! Cab, Bob?”, a solid contender for the most over-punctuated title in television history, was the episode where the show truly snapped into focus, as Bob driving an unlicensed taxi to pay for Tina’s party proved the ideal demonstration of how the show could find sweetness and empathy in even the most outlandish scenarios. Tonight’s “Bobby Driver”, which is basically Collateral if Tom Cruise were an irascible senior citizen who was really into quilting, puts the show’s lovable ethos to two of its most extreme tests. Can Bob find anything worthwhile in Edith Cranwinkle, who has done nothing but make his life miserable ever since her debut in the first season’s other show-defining episode, “Art Crawl”? And can the kids—well, just Louise, really—find it in their hearts to not get revenge on birthday boy Holden by gifting him Gene’s dirty socks? If there’s going to be one obvious stumbling block for “Bobby Driver,” it’s that we’re going to have to spend a lot of time with Edith. She and her husband Harold are the epitome of characters who work best in small doses, so it’s a gamble to devote this much time to her and Bob driving around. “Bobby Driver” steers into just how obnoxious Edith can be for most of the episode, with the pills and “fits” an especially transparent bit of her being awful. Still, the episode finds some fun ways to change up the character dynamics, most obviously when we see her share a scene with Mr. Frond. Given Frond’s love of all things knitting and yarn-related, it’s natural enough to see him as the only non-septuagenarian in the quilting circle. But to learn he has a series of action blockbuster-themed needlepoints, including Keanu Reeves and Patrick Swayze in Point Break and a spoiler-filled interpretation of Con Air? That’s downright inspired, especially Edith’s distracted promise that she won’t look at the spoiler-y parts as she searches for Frond’s part of the quilt. The episode also gets some good mileage—I swear I’m not trying for these driving puns—out of the unexpected inclusion of Sergeant Bosco. Gary Cole is always the perfect mix of bored and sleazy as the town’s possibly only detective. His mother Lillian isn’t especially Bosco-like, but that just works in the episode’s favor. Not only do we get all the standard low-key corrupt hilarity from Bosco, we also get to see him as a bored large adult son who just wants some dessert. It would be a stretch to say this episode deepens Bosco—it’s only marginally more plausible to say it deepens Edith, but we’ll get to that—but it’s fun to see Bob’s Burgers add more layers to its characters even nine seasons in, especially as they open up new avenues for jokes. Bosco asking Bob and the Cranwinkles to feign being arrested at the end is a cute way to wrap things up, but it also sets up some vintage Bosco jerkishness when he promises to drive them around for awhile and drop them off somewhere inconvenient. Still, for this all to work out in classic Bob’s Burgers fashion, Edith needs, if not exactly redemption, then at least a moment where we understand she’s not as bad as all available evidence suggests. The contents of her Lillian-rejected quilt would fit the bill. With the reveal of Edith’s early days being raised by the local freak show, “Bobby Driver” again proves a distant echo of “Sheesh! Cab, Bob?”, which showed Bob befriending and inviting to Tina’s party the kind-hearted denizens of the town’s seedy nightlife. Bob is often at his best advocating for the weirdos and the misunderstood, though the episode wisely doesn’t strain for some larger point about how everyone’s a “freak” or something like that. Rather, it’s the reverse: The people in that show were just that, people, and worth remembering for what they meant to a little girl all those decades ago. Besides, it’s not that Edith turned out how she did because the people in the freak show raised her—it’s because they raised her that she didn’t turn out even worse than she did. The kids’ story is an ideal complement to all this. While Bob doesn’t spend too much time explicitly ruminating on whether there’s any good in Edith, at least not until the pivotal moment he decides to stand up for her, Tina is desperate to prove to Louise that there’s good in Holden. Not desperate enough to do anything to actually strike up a conversation with him, which is a bit of an odd note in the episode’s storytelling. Then again, Tina can slip into hilariously ineffectual mode without much effort, so perhaps it’s not that ridiculous she only gets as far as hitting a croquet ball slightly in Holden’s direction. As we discover when he catches Louise preparing to replace the off-brand Rubik’s Cube with Gene’s disgusting socks, the birthday boy is only too happy to reveal how much he hates the entire event, which is likely why a lot of the kids’ story up to that point is them talking about what they should do as opposed to actually doing anything. That minor narrative wonkiness aside, the birthday party is a reliably fun—medium fun, even—little story, good for a bunch of great Gene one-liners and awkward Tina moments on the way to Louise showing her humanity. “Bobby Driver” hits a similar balance with Holden’s parents that it does with Edith: Yes, they’re definitely awful, but they don’t really mean to be, and they have their reasons. Their social media obsession isn’t born of unmotivated vapidity, but rather an admittedly misguided need to compete with all their adult friends. With so many ridiculous characters running around being unpleasant to the Belchers, it would be easy for the episode to tip over into mean-spirited territory, and it’s to the show’s credit that it sidesteps this trap. Besides, it’s not as though the show ever has to sacrifice the jokes: Just look at Holden’s parents, still snapping and liking photos even with their phones stuck in their pockets. “Bobby Driver” provides a great storytelling backdrop for the characters to do what they do best: The kids all in their own special way do whatever pops into their heads, while Bob just tries to survive the world’s ever-mounting absurdity. The episode manages to take even a character as unpalatable as Edith Cranwinkle and make her, well, still not sympathetic, but entertaining enough to be worth spending an episode with. That’s a feat nearly as impressive as Linda getting Teddy to like sushi... which, you know, she sort of accomplishes. It took me longer than I’d like to admit to work out the episode title is a pun on Baby Driver. 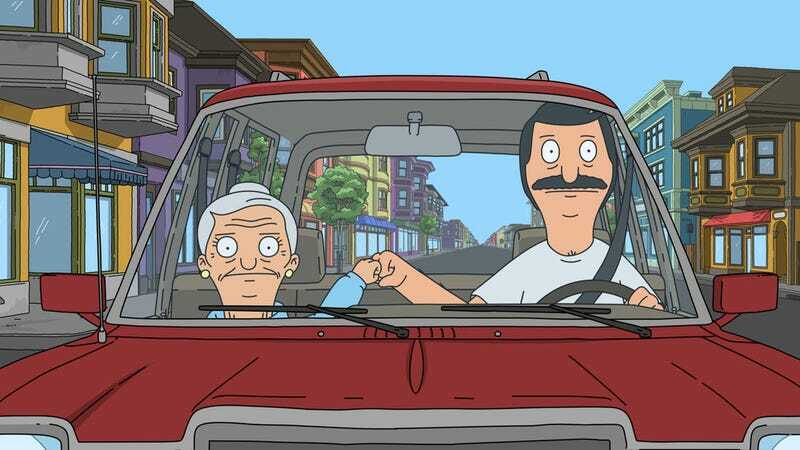 I guess, given that movie is also about a character being forced to be a getaway driver, one could argue this episode is really just inspired by that movie, especially since Bob’s Burgers rarely does full-on parodies. But I’m much too invested in the idea of Edith as the show’s answer to Tom Cruise’s ruthless assassin to abandon the Collateral parallel now. Harold is so delightfully fed up with Bob and his crap at all times. When even Edith is telling him to cut it out and do what Bob says, you know we’re in special territory. The Charleston instructor repeatedly telling Tina to wiggle her thumb was giving me serious “Mr. Burns ordering Don Mattingly to shave his sideburns” territory. Someday, I’d really like to be able to understand the world not through the prism of The Simpsons, but I’m pretty sure best-case scenario I just go back to Bob’s Burgers reminding me of old King Of The Hill plots. None of this is a bad thing, mind you.